I've reached one of those travel stages where I am feeling an overwhelming sense of restlessness, once I finally managed to put a finger on the feeling. There are various things I could be doing: sewing the cat quilt, making the most of Seattle-specific opportunities, working on syllabi for the spring semester, reading, spending time with my parents. Cute visions of little houseplants and succulents flash through my mind, apropos of nothing, or perhaps apropos of conversations about gardening (though yet again our access is to a garden we cannot call our own). Then I remember Wendell Berry, and his comments on restlessness as a part of the modern condition, due to how people have built their cities and lives around consumerism. This takes the edge off, slightly. Yesterday scrottie and I went for a ride along the northern portion of the Lake Washington Loop. We were due for a ride, after sitting around and eating too much sugary holiday food. 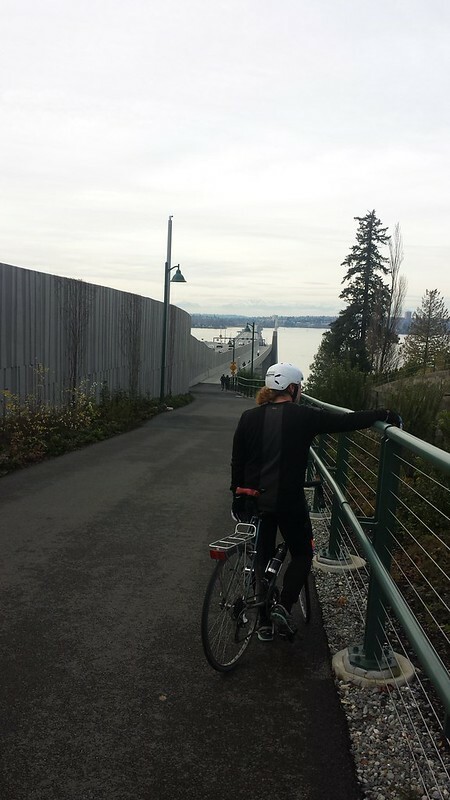 Plus I had been wanting to finally check out the 520 bike-pedestrian path. Along the Burke-Gilman trail we encountered a pair of randonneurs working on a New Years Day Permanent, and chatted with them up until we reached our turnoff for the Honey Bear Bakery. The Sammamish River trail reminds me somewhat of the Interurban Trail that we take when riding down to Enumclaw, except the Interurban Trail feels slightly more grim. There were a lot of people out walking and riding yesterday. I don't think S had gotten to see the full extent of Lake Washington before, but the 520 bridge is a good point for appreciating that. Mostly cloudy weather meant some nice brief glimpses of the Cascades and Olympics. At first the seatpost on the Blue Devil was slipping, so when I went to retighten it I tried to crank the bolt down harder. That stopped the slipping, but my readjustment height was ever so slightly too low, so now my leg muscles are complaining. By this point I'm doubtful that we'll manage any non-urban hiking on this trip, which is contributing to the restlessness; S keeps getting work requests when he checks his e-mail first thing in the morning, which makes it difficult to have conversations about making plans, and on top of that I have those lingering feelings that I should be working on my syllabi.